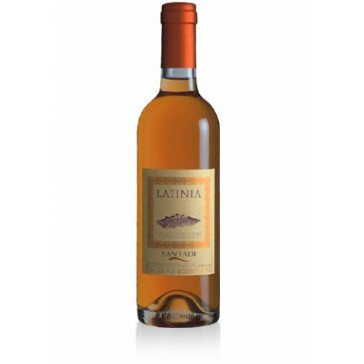 A sweet wine, obtained from the slow harvest of Nasco grapes from sapling vineyards (antique Latin vineyards) from the lower region of Sulcis. They are then left to mature on the plant. After the separation of the must from the vinacce, in the stainless steel containers then ferments with its own ferments very slowly until it naturally stops its fermentation process. Nasco wine evolves for months in French oak barriques of the third process where it is then thinned and therefore produces its delicate bouquet. It is bottled after the fermentation and thinned in glass for a few months before putting it on the market. It's an intense yellow colour. Its fragrance brings honey and mature fruit to mind. Its texture is intense, warm sweet without being too heavy and of great structure. Founded in 1960 the cellar now has about 300 contributing partners with vineyards in the municipality of Santadi, Villaperuccio, Nuxis, Giba, Piscinas, Masainas, Sant'Anna Arresi, Perdaxius and Tratalias for a total of 500 hectares at altitudes of maximum 250 metres above sea level and descending sweetly down to the marine littoral. The climate is fairly dry in the summer period, but the marine breeze abates the temperature in the hottest months. There is rainfall during the autumn-winter period. It is perhaps for this reason that Sulcis red wines are full, rich and so generous. In this area it is possible to observe the marvellous sand, which allows for foothill cultivation and it is here that you can pick marvellous Carignano grapes of, which only the sapling without the rootstock can produce with exceptional organoleptic characteristics and superior to other grapes. Perfect with desserts, in particular fruit pies and dried pasties, even great on its own at the end of a meal. It should be served at a temperature of 10-12 degrees centigrade. The perfect glass is a smooth and transparent crystal glass. This wine can taste much better after various years. The bottles must be placed horizontally in a cool, damp and dark cellar.